Brams Racing’s John Bradshaw is pushing the boundaries of the Japanese car tuning scene in the UK. The 2011 season has seen him break deep into the 6’s for the first time. That is to say, his Nissan 350Z can cover the standing quarter-mile dragstrip in less than 7 seconds, and hits over 200mph in the process. There is some standard good ‘ol American drag racing engineering that will get these magic numbers, but no-one in the UK is doing it like John is. John’s 350Z uses a Japanese V6 - exactly the same block as the showroom 350Z - but with revised engine internals installed. This is boosted to an astonishing 1800 horsepower powered by twin AET turbos and some very cunning tuning by the Nissan experts at Abbey Motorsport. Sticking in an American V8 would have been easier and cheaper, but the challenge for John was always to build the ultimate incarnation of the Japanese car, and that meant pushing the boundaries in every direction but within the constraints of the defining features of the 350Z. John’s car first reached the 6’s (6.77 seconds @ 203mph) at Santa Pod’s Easter Thunderball event in April 2011, and proved it was no fluke by running 6’s again at the Performance Tuning and Modified Show on May 15th. Now the Japanese tuning scene is in the 6’s where will it end? In a way, it doesn’t matter, because watching this car do its thing on the dragstrip is something you can never tire of. 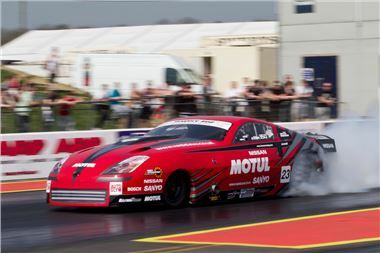 The car is currently competing in the Jap Drag Series, which has 3 rounds left, the next of which is at the JapShow at Santa Pod Raceway on 19th June.